In my February Favourites post I mentioned that I had a lot of new things to play with and that I was looking forward to this month. Well, I ended up with even more new things than I originally thought and have been swatching like an absolute mad woman. March has definitely been a extremely busy month for me, which has turned into me having a lot of favourites. That being said, I am going to keep the chattering to a minimum and get straight into it. Warning: this post will be quite picture heavy. I have done a lot of nail art this month and I am a little surprised at how many favourites I actually have. I tried so hard to cut them down but I just couldn't. I'm not sure if that is a bad thing or not. Hopefully April will be another good month for nail art. Stamping is still my number one go to technique. I just can't get enough of it. This month I have managed to try out some new plates (well new to me - some of these have been around for a little while) and some new stamping polishes. This is easily my favourite of favourites when it comes to plates this month. You can get out my original post here. There is just something about this style of plate that I just really love. You can find the original post here. This is the last of the Lina plates that I have been loving this month. It just has so many great floral designs. You can find my post about this plate here. I am a huge fan of Powder Perfect's stamping polishes and I am so excited that they have added some new ones to their collection. While they have actually released three new shades this month, only the two pastel shades have made it into my list of favourites. You can see the original post here. I definitely have had a heap of new polishes to play with this month. Some I have swatched already but haven't posted yet so I will not be including those. I have only included the polishes that I have already shared here on my blog. I'll start with the indie polishes first. I was so honored to be asked to swatch Glam Polish's latest collection and I couldn't be happier. While I am a big fan of the entire collection, only a few have made it into my favourites for the month. My favourites are Another Day Of Sun, It's A One Woman Show, Chasing All The Lights The Shine, City Of Stars and As Long As It's Pure Jazz. You can see more swatches of these polishes (plus the others in this collection) and my review here. I am such a sucker for creme polishes. I know a lot of people find them boring but I seriously love them. They are definitely my go to type of polish. As soon as I saw the Serenity Collection I instantly fell in love and applying them made me fall in love even more. You can see my post here. Powder Perfect celebrated their third anniversary last year and stupidly I have only just got around to swatching them. Don't judge me, I have a lot of untrieds and a shopping addiction ok? Lol. Anyway, I swatched them and I love them both. You can see more pictures and a review here. That wraps up the indies I have been loving for this month, now onto the mainstream polishes! I definitely didn't love this entire collection, in fact I was actually disappointed with it. That being said, there are so amazing polishes in this collection. My favourites are Blanc Out, Too Much Of A Good Fling and We Run This Beach. You can see the full collection in my post here. While I did like the Essie Spring 2017 Collection there was really only one stand out polish for me. I've actually worn this polish a couple of times now. It's gorgeous. You can see my post with the full Spring Collection here. I am a big fan of this entire collection but there are a handful of the shades that I consider my favourites - Two-Timing The Zones, Getting Nadi On My Honeymoon, Is That A Spear In Your Pocket?, Super Trop-i-cal-i-fiji-istic, Polly Want A Lacquer? and Suzi Without A Paddle. You can find my original post here. If you haven't seen one of my favourites posts before then this part may seem a little odd. I like seeing the things that you guys are liking. It also interests me to see if they are similar to the things that I have been liking. These are the top nine most liked pictures on Instagram this month. That rounds up all the favourites for this month. Like I said it has been a very busy month for me, and it's looking as through April is also going to be quite busy. My daughter is on school holidays for the next couple of weeks so I have my fingers crossed that I can keep up with myself. I have managed (and not intentionally planned) daily blogging for this whole year so far. I've really been enjoying daily blogging and I hope you guys are enjoying seeing all the posts from me. I would love to know what some of your favourite things are for this month. Let me know in the comments below. Last week I shared with you my swatches and review of Glam Polish's Technicolor World Collection (you can see that post here if you missed it) and I thought it would be fun to share with you some of the nail art I did using the polishes from this collection. As a little word of warning, this post will be quite picture heavy (not that that is a bad thing) because there are a couple of pictures of each mani. Right, so let's get into it! Let's start with the very first lot of nail art I did with this collection. I simply couldn't resist doing a gradient with Another Day Of Sun and It's A One Woman Show. I mean how perfect are these polishes together? Of course I had to stamp over this gradient. For this I used Lina Nail Art Supplies Feeling Shapely 08 and Powder Perfect's Black Stamping Polish. When you have a polish that is called "City Of Stars" you simply have to do some form of star nail art don't you? I love how this turned out - both the glossy and matte versions. Glitter gradients are one of those things that I should do more often. They are easy to do and always look so pretty. I love Chasing All The Lights That Shine over Essie's Backseat Besties. 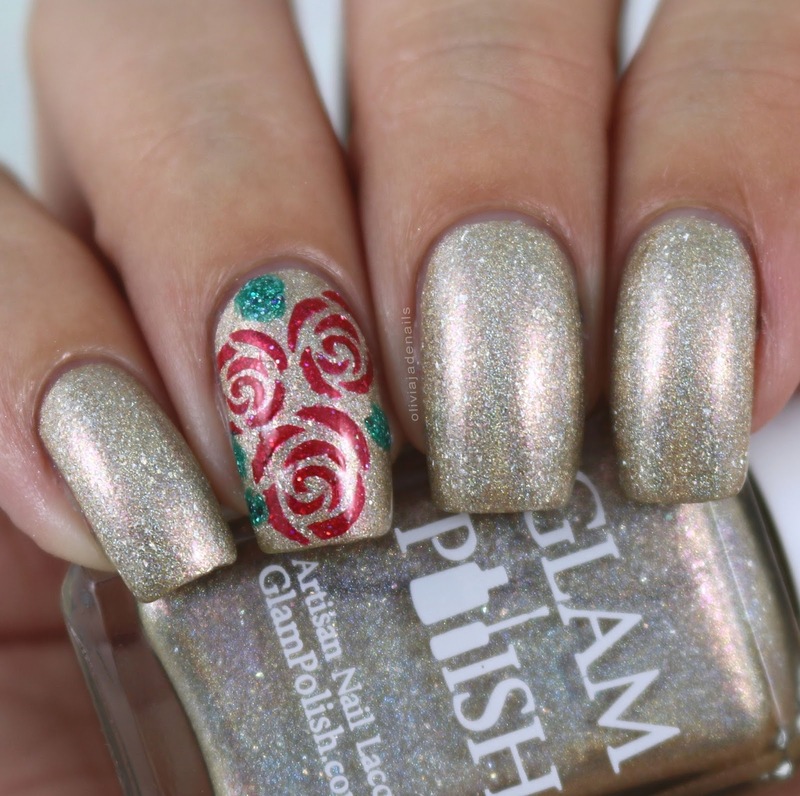 This next mani has a bit of a Beauty And The Beast feel about it (no I haven't seen the new movie - but I have seen the cartoon version a few times thanks to my Disney obsessed daughter). For this mani I used Why Do You Say Romantic Like It's A Dirty Word? as my base and used I'll See You In The Movies and Here's To The One's That Dream. Nail vinyls are from What's Up Nails. And for the final nail art mani I went for a simple dotticure. Again, this is another really simple thing to do and I really should do dots more often. For this mani I used OPI Alpine Snow for my base and then dotted As Long As It's Pure Jazz, What A Waste Of A Lovely Night and Why Do You Say Romantic Like It's A Dirty Word? That's all of the nail art I have done with the Technicolor World Collection. I think a few of these manis may make it to my monthly favourites. I think my favourites are going to be a little out of control this month. Oops. Don't forget that the Technicolor World Collection will be launching on Saturday 1st April in Australia (or Friday March 31st in the USA) from Glam Polish. 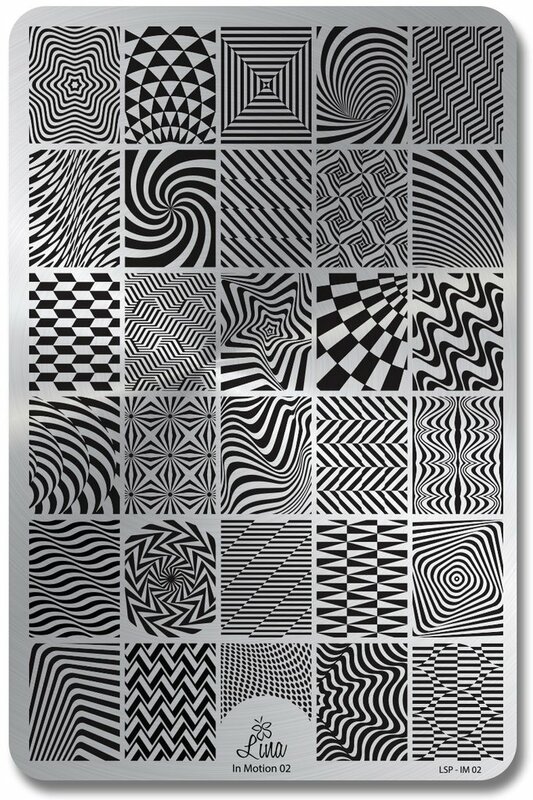 The full set of ten shades will be available at the special price of $108USD for the first 72 hours, after that the set will be available at the regular retail pricing of $12USD. It's time for another edition of The Digit-al Dozen Does Birthdays. Now this month we are doing something a little different, it is also a little bit of a surprise for one of our members. Earlier this month Amber (Nails Like Lace) gave birth to her beautiful baby girl and we thought it would be a nice surprise to all do a baby mani in honour of little Lyla. I couldn't resist doing an all pink mani for today. 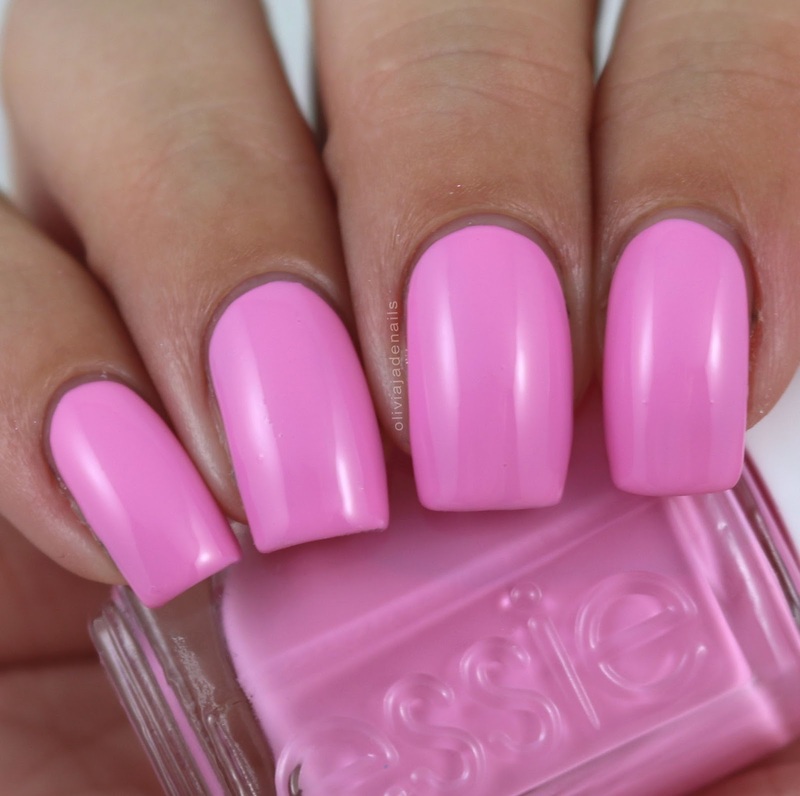 The pink I used for my base is Essie's Backseat Besties (which I am loving!). Of course I needed something sparkling so I added China Glaze You're Too Sweet and stamped using Powder Perfect's Pale Pink Stamping Polish (which is coming soon!). Stamping designs are both from Uberchic Beauty's Little Baby Stamping Plate. Congratulations again Amber on your beautiful baby girl. She is so precious. I am excited to see the manis the other girls have done. Well this is a rare occurrence for me - two blog posts in one day. I definitely won't be doing this too often (I'd need a lot more hours in the day if that was the case) but I couldn't not share this new polish from Powder Perfect with you. If It's Not Baraque is maroon holographic nail polish with silver flakies & ultra-holo glitters. I think this is such an interesting polish and it has such good depth about it. I'm not usually one for reds (although I am slowly coming around to them) but I am a fan of this. The formula is great and is opaque in two coats. If It's Not Baroque is available for pre-order on Powder Perfect's Australian site and international site. 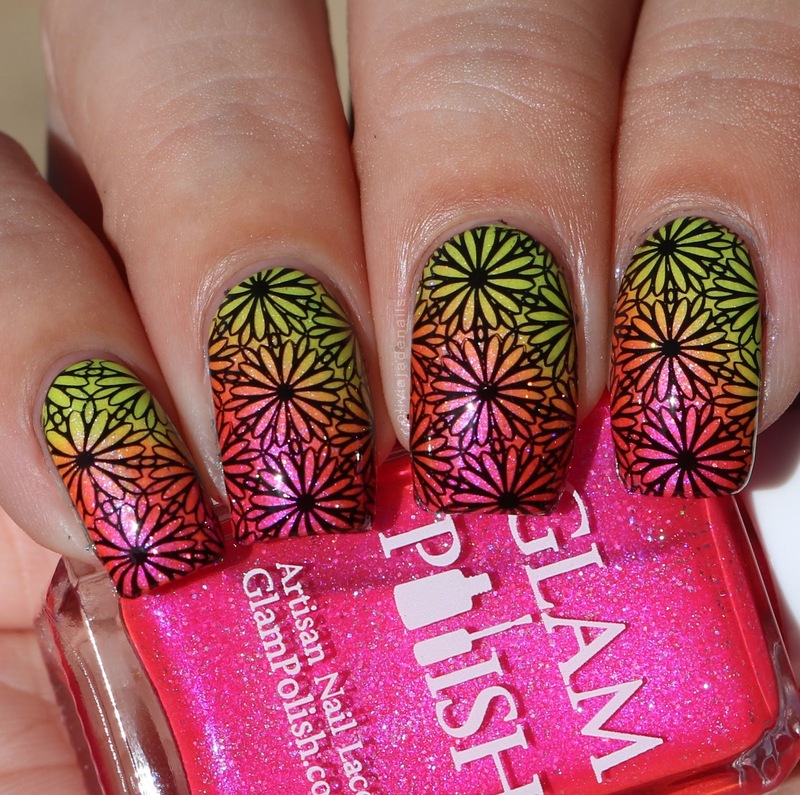 It is definitely no secret that I am a huge fan of Powder Perfect's stamping polishes. To date I have gone through a full bottle of their white polish (and have made a good dent in the second bottle) and have gone through three bottles of their black polish. No I am not paid to say good things about the stamping polishes, yes I did get sent my initial bottles of the black and white polishes but I have gone back and purchased more (I believe I have about 4 back up bottles waiting for me - you can never have too much of a good thing). Anyway, you can imagine my excitement when Jacinta announced that she would be adding three new stamping polishes to the range. I just so happen to have them to share with you today. Like with my other stamping polish swatches I have used each of these polishes over a black and white base so you can see how this look over lighter colours and darker colours. 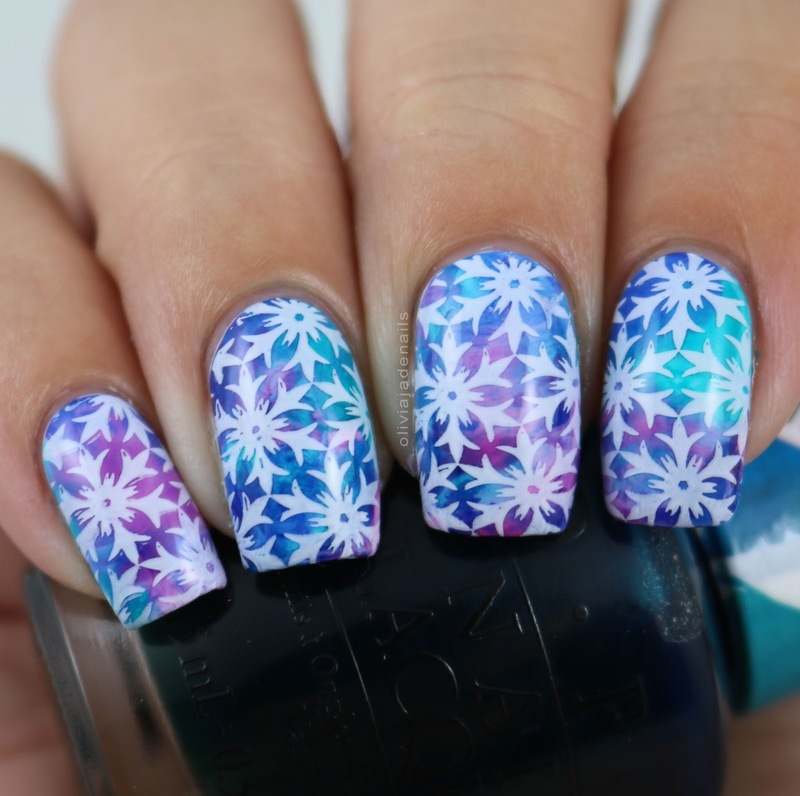 The stamping image I have used is from Powder Perfect's Art Deco 01 plate. 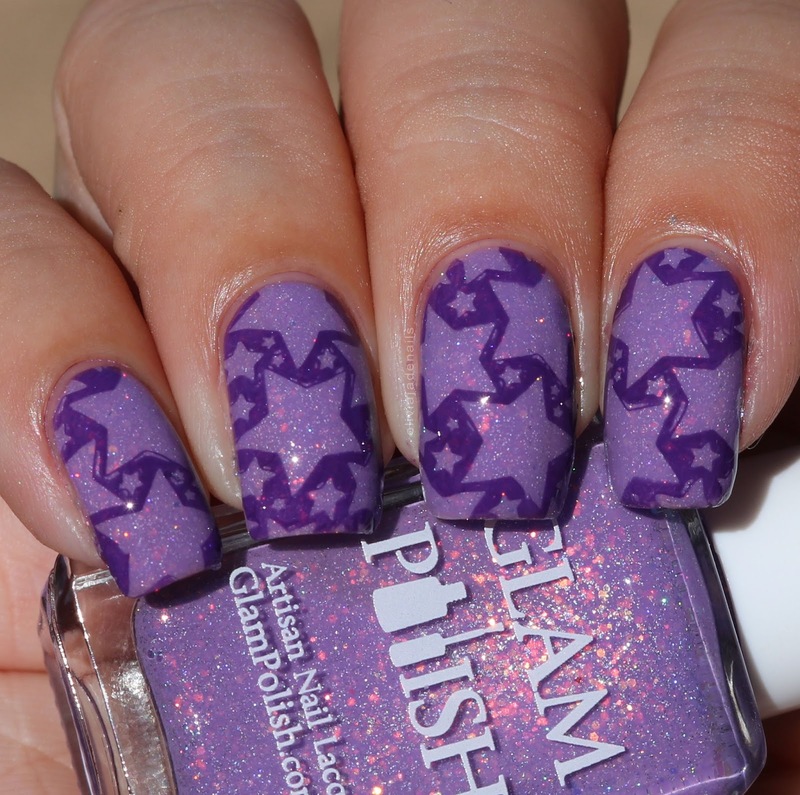 Lilac Stamping Polish is a lilac creme stamping polish. I am seriously impressed with this polish. You can bet I will be getting a lot of use out of it. Pale Pink Stamping Polish is a pastel pink creme stamping polish. Again, really impressed with this one. The pink is more noticeable over the white than it looks in my picture but it got a little washed out. I have used this polish a few times now and I definitely a fan. Teal Stamping Polish is a shimmery teal stamping polish. This one does stamp well, but is a little trickier to see over the black. 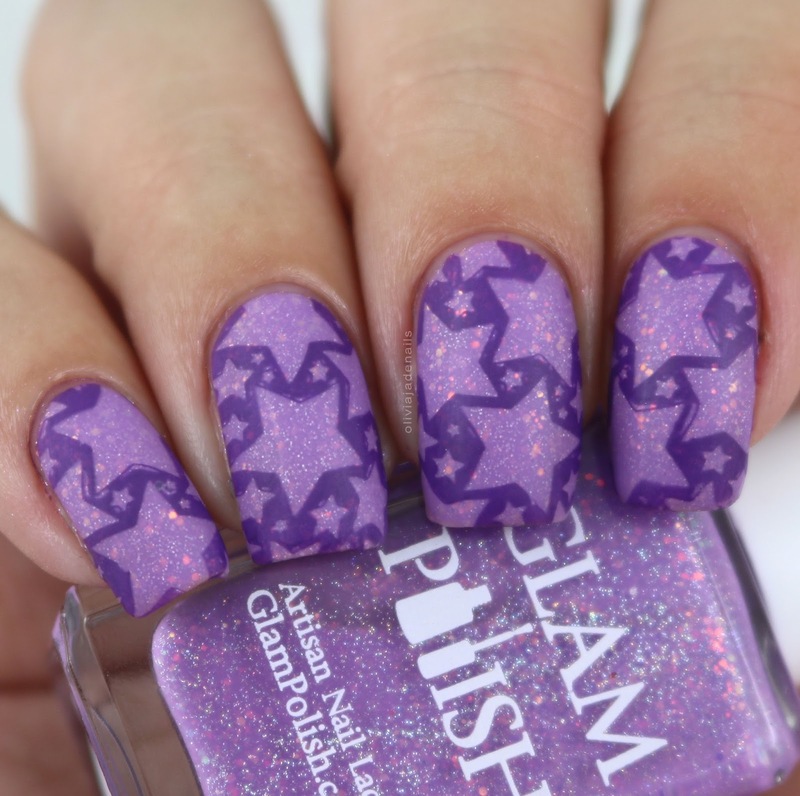 These stamping polishes all stamp so well. My personal favourites are the Lilac and Pale Pinks for a couple reasons. 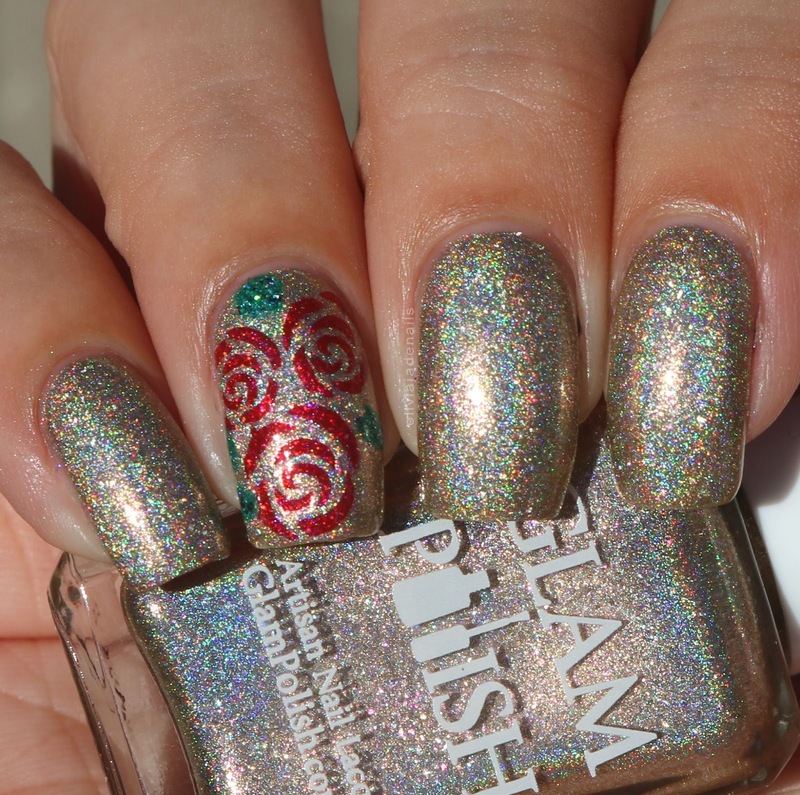 They are definitely more my type of colours and I do prefer creme stamping polishes over shimmers and metallics. All three stamping polishes are available for pre-order on Powder Perfect's Australian site and international site. 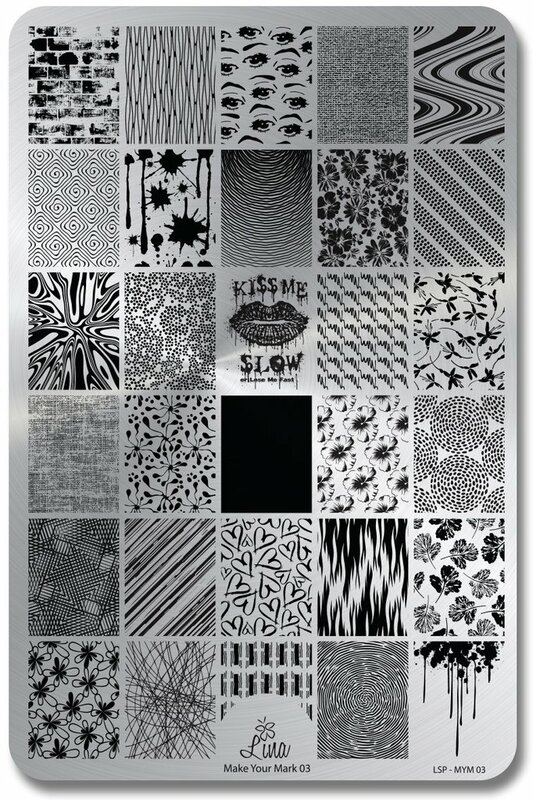 It's the start of another week which means it's time for another Lina Nail Art Supplies stamping plate review. I promise I am getting through this pile of plates slowly but surely. I am actually a little happy that there has been a break in the new releases from Lina Nail Art Supplies. While they are catching up on orders I am catching up on my swatches and reviews. Plus I can save some money (read that as spend my money on polishes instead of stamping plates - my wishlist for polishes is growing by the second here). 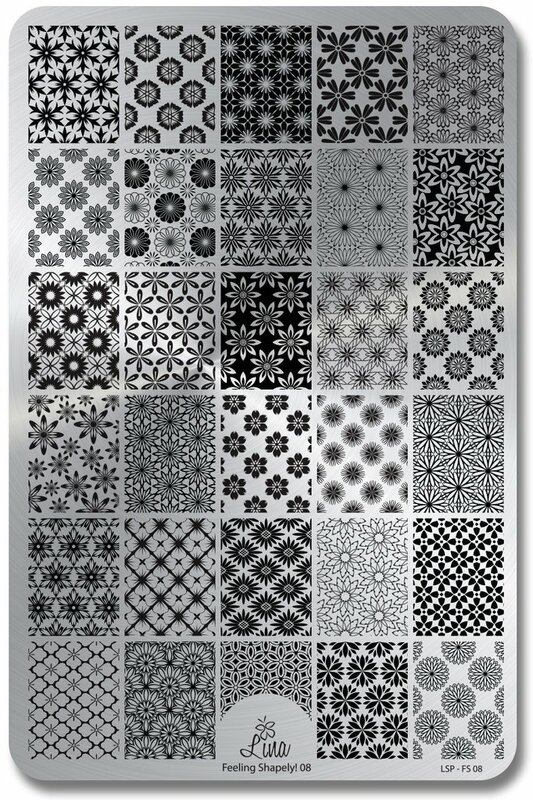 Anyway, today we are going to be looking at the Feeling Shapely 08 stamping plate. This plate definitely has a floral theme happening with it. Definitely no complaints from me about that. I love floral images and these are quite pretty. For this first mani I used Emily de Molly Gazing Upwards for my base and stamped using Bundle Monster's Indikon. My second mani with this plate is definitely more colourful than the first. 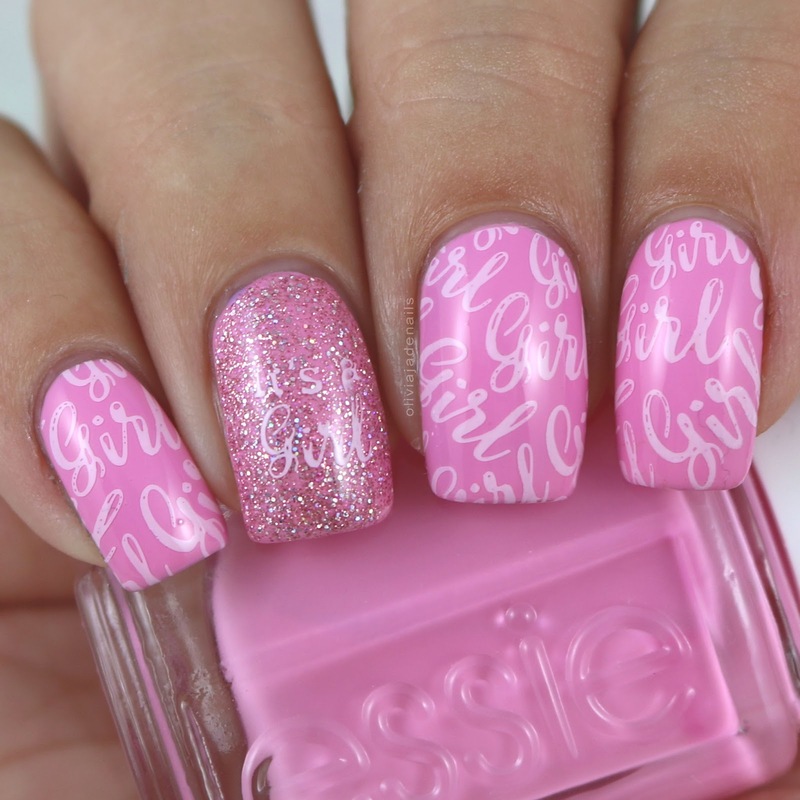 This is one of those manis that I am not sure if I like it or not. I love the base and I love the image, I'm just not sure I love them together. Anyway, for my base I smooshed together OPI's Pen & Pink, Purple Perspective, Indigo Motif and Turquoise Aesthetic and stamped using Powder Perfect's White Stamping Polish. Now this last mani I had to include two pictures of (one from my light box and a sunshine picture) because it's just so pretty. For my gradient I used Glam Polish Another Day Of Sun and It's A One Woman Show and stamped using Powder Perfect's Black Stamping Polish. I can definitely see me getting a lot of use out of this plate. The designs are great and they stamp so beautifully. 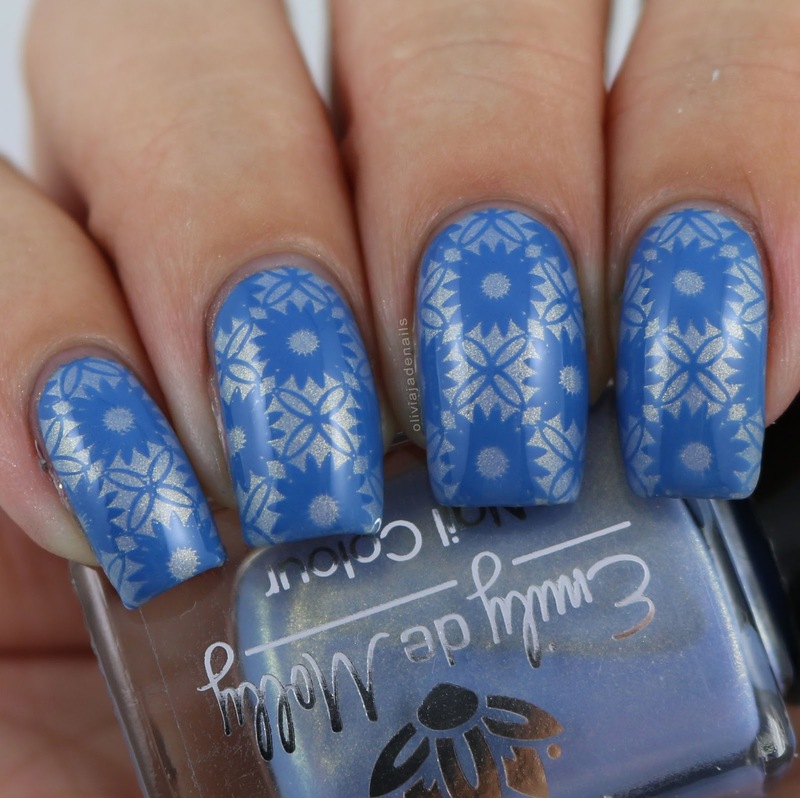 At the time I am writing this post the Feeling Shapely 08 stamping plate is available from Lina Nail Art Supplies but I would suggest that you get in quick. These babies seem to be selling out quite quickly. On this day four years ago I posted my first ever picture on Instagram! It's crazy for me to think that I have been sharing my nail pictures for so long now, and even crazier to think that I originally had no intentions of ever posting my nails online at all. My my, how things have changed! Anyway, today I thought it would be fun to do a bit of a now and then post. As cringe worthy as it can be to look back, it's sometimes nice to see they changes. 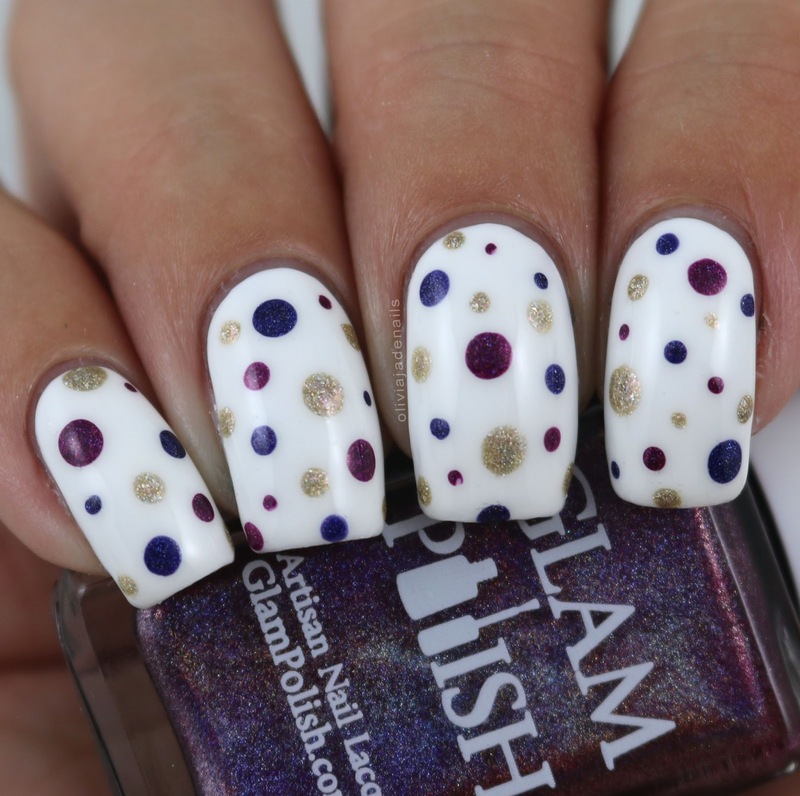 Let's start with today's version of this mani and then work backwards to the initial post. For these manis I used China Glaze Keep Calm, Paint On and Femme Fatale Cosmetics A Tisket, A Tasket. Sadly I didn't actually recreate my original mani in 2015 or 2016. Instead I did some different blog posts. For my 3rd Instagram Anniversary I did a post with my most used polishes. You can check that post out here. I would say that a lot of the polishes in that post are ones that I still use a lot now. For my 2nd Instagram Anniversary I did a post with my favourite nail art manis that I had shown on Instagram over those two years. You can see that post here. This was the first time that I did a "now and then" comparison picture. There was definitely some improvements in that year but wow! I cringe now. And look - two watermarks! I think at the point I had had a few pictures stolen with that big label cropped out. Here it is: my very first picture I ever posted on Instagram. I could pick on a heap of things but I am not going too. We all start somewhere don't we? And because who doesn't love a collage? It's funny looking at this mani now (and it has nothing to do the pictures themselves) is I have no clue why I chose these polishes for my first mani. I mean the polishes do work together (although I probably should have put a creme polish not a shimmer polish with the glitter) but I don't actually think I like the mani. Guess it just shows how tastes can change over the years. I have also noticed that there are little bar glitters in the Femme Fatale polish. I don't think I have ever noticed that before...or maybe it's been so long that I just don't remember them. I really want to thank everyone who takes the time to like or comment on my posts (on whatever platform), to those of you who follow me, and to everyone who recreates my manis. You guys are amazing!! Happy weekend everyone! I don't know about you but I am so happy that it's the weekend. It's been a long week for me. Today I have something super exciting to share with you. 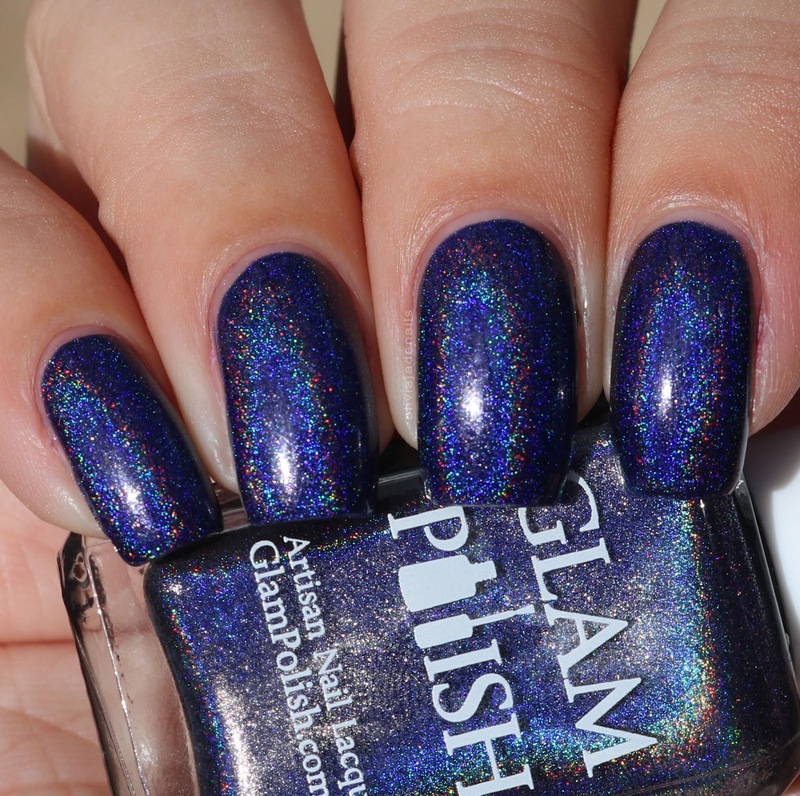 I have the new, soon to be released Technicolor World Collection by Glam Polish. I nearly fell off my chair (not literally, but my heart certainly stopped for a second) when I received a message from Rachel asking if I would like to swatch this collection. Naturally I jumped at the chance and now I have them to share with you. The Technicolor World Collection is a rainbow of dazzling shades inspired by the costumes, set and music from the movie/musical "La La Land". 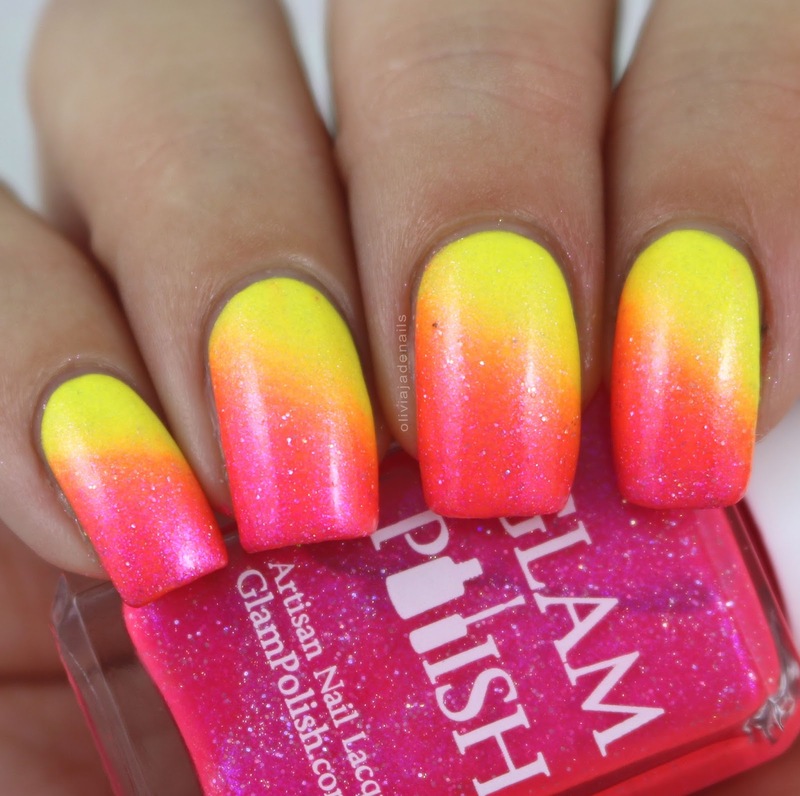 Another Day Of Sun is a bright yellow with pink shimmer, a hint of holo and a splash of fine holo microglitter. I'm a big fan of this one. Not only is it bright (I do love my bright colours) but I love the pink shimmer in it too. Gives it something a little different. The pink shimmer is definitely visible on the nails but my camera just wasn't quite picking it up well so I have included a picture of the bottle so you can see the shimmer better. The formula is really easy to use. My swatch shows three coats, but you can easily get away with two coats. It was just a little bit too see through on the tips for my personal taste. 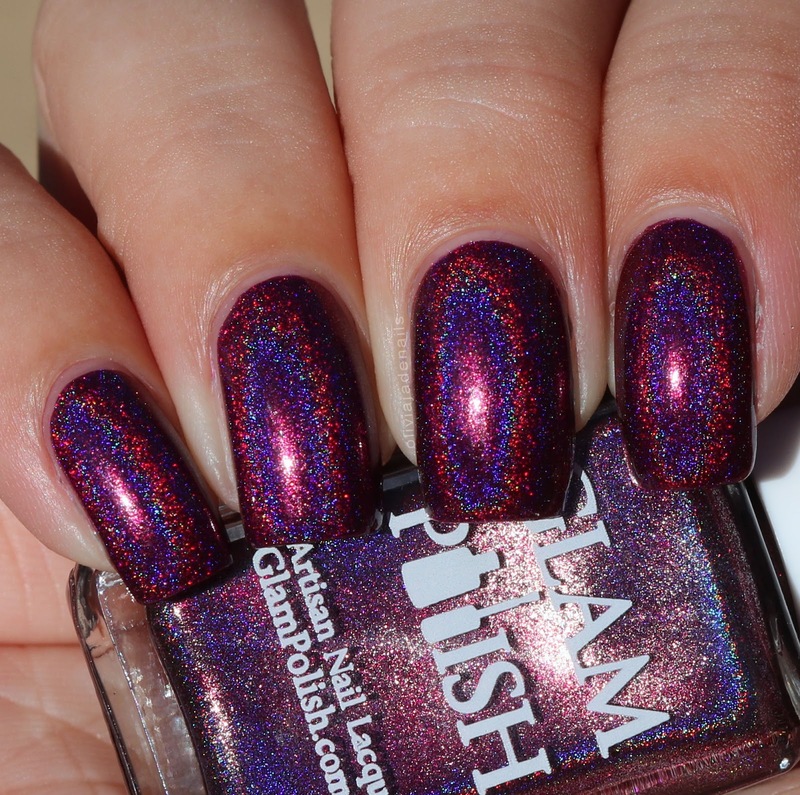 As Long As It's Pure Jazz is a deep plum intense holo. This one I love! The colour is gorgeous (both indoors and in direct light), the formula is amazing and it stamps well. If you were in a rush you could easily get away with one coat for this polish. My swatch shows two coats. Chasing All The Lights That Shine is a mix of rainbow metallic glitter, shifting iridescent glitter and a hint of fine holo microglitter in a clear base. Big fan of this polish too. There are so many different colours happening that you can easily wear this polish over any colour. I also really like the iridescent glitter in the mix as well. The glitter payoff is great. I used one coat (just brushing it - not dabbing it on) over Essie Excuse Me, Sur. City Of Stars is a lilac crelly with shifting iridescent glitter and fine holo microglitter. I'm sure it will come as no surprise that I love this one. 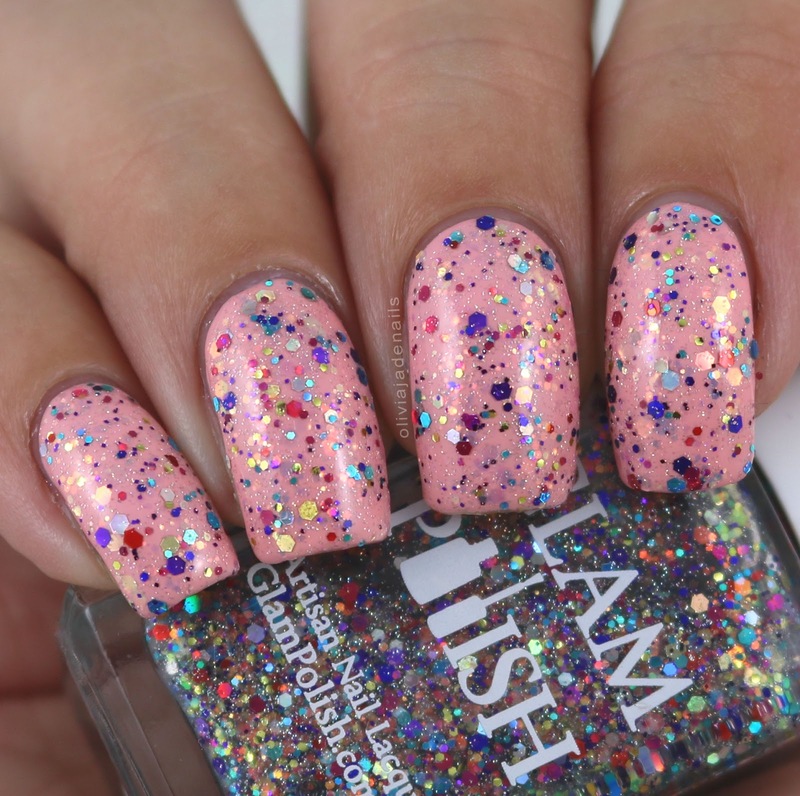 The colour is beautiful, the glitter is really pretty and the formula is great. I used two coats for my swatch. Here's To The Ones Who Dream is a jade scattered holo with shifting flakes, holo flakes, ultra holo glitter, and fine holo microglitter. I think this is a really nice (and sparkly) polish. The formula is great and is opaque in two coats. I'll See You In The Movies is a red scattered holo with ultra holo glitter and fine holo microglitter. Now I am not really a big fan of red polishes but I quite like this one. There is a glitter in this polish that makes it glow. It's really pretty. The formula of this one is great too. I used two coats for my swatch. 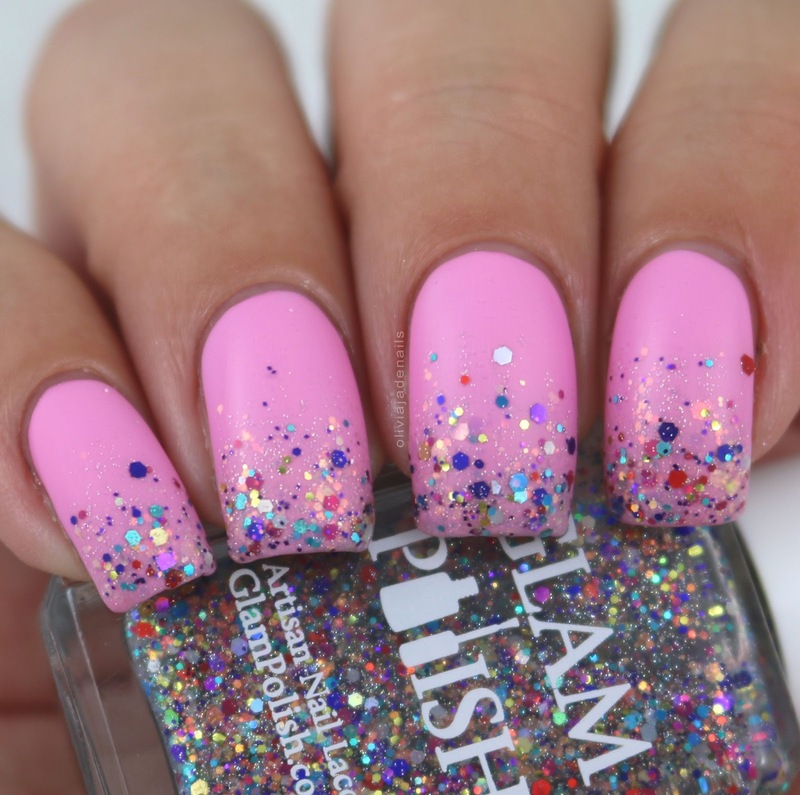 It's A One Woman Show is a bright pink with blue/purple shimmer, ultra holo glitter and fine holo microglitter. Love this one! I mean it's bright pink, why wouldn't I love it? The colour is amazing, and the formula is great. I used three coats for my swatch. Someone In The Crowd is a cobalt blue crelly with iridescent flakes, shifting flakies and fine holo microglitter. Again, this is really pretty shade. The first coat did seem a little on the sheer side so I did apply a slightly thicker coat than I usually would. I probably didn't need to do that as the second coat built the colour up well. My swatch shows two coats. What A Waste Of A Lovely Night is an indigo intense holo. I think that this is a great polish. I love the holo in it. I think it would make a great base for some starry nail art. The formula is a breeze to work with and it is opaque in two coats. Why Do You Say Romantic Like It's A Dirty Word? is a light gold intense holo with pink and peach shimmer and holo flakes. I don't tend to do a lot of gold polishes but if I do then this is the type of gold I like. I also really like the added shimmers in this one. They are so pretty. The formula is great and applies so evenly. I used two coats for my swatch. Overall I am a big fan of this collection. The formulas across the entire collection is fantastic. They all apply so easily and quite evenly. I think there is also a fantastic mix of shades too. My personal favourites would have to As Long As It's Pure Jazz, It's A One Woman Show, City Of Stars and Chasing All The Lights That Shine. I have done some nail art using this collection so I thought it would be fun to put all of them into a blog post as well. I'll be posting that next week so keep your eyes open for that. The Technicolor World Collection will be launching on Saturday 1st April in Australia (or Friday March 31st in the USA) from Glam Polish. The full set of ten shades will be available at the special price of $108USD for the first 72 hours, after that the set will be available at the regular retail pricing of $12USD. Which shades do you have your eyes on?